Simple steps to battle attic mold infestations. Whether caused by attic leaks, shingle failure, or exhaust fan condensation, following a few simple steps can get the mold infestation under control. Flood Water Cleanup is the same no matter the source of the flood water. Remove the muck, dirt and filth, then actively use a bleach-free mold killer to prevent mold finally, use fans to dry out. Cleaner Today supplies the premium MoldSTAT Plus flood mold killer in sizes to fit any situation. The charitable arm, “Cleaner Today Cares” provides matching funds to expedite shipping to affected areas. The answer to Deanna’s question is yes, you can use MoldStat products, specifically MoldStat Plus, in the washing machine, or in handwashing if you prefer, to destroy the presence of, and the odor generated by, mold on clothing. The only restriction on this use of MoldStat Plus is that the fabric to be cleaned MUST be water washable. If the care instructions indicate that the fabric must be dry cleaned, then you should not wash the garment in water with MoldStat; instead you should consult your dry cleaner about cleaning options. I’m contacting you about the MoldSTAT Plus that I recently used in my crawl space under my house. At first, when I sprayed it on the sub-floor and joists, I did not see any immediate change. Three days later I had a mold removal company come out to provide me an estimate on how much it would cost to have it professionally removed. As I crawled under the house to show him the mold that was there 3 days prior, much to my delight it was gone! Mold grows by sending out spores as well as by rooting itself to the surface it is growing on. While the above process will have removed the spores and surface material we still need to kill those mold roots to keep the mold from returning. MoldStat Plus is excellent for this purpose and if you haven’t already used it for the initial cleaning, now is the time to measure and dilute the super-concentrate to the working solution strength. A little bit of this product goes a long way. Thoroughly soak the surface where the mold was located and allow the product to dry naturally over a few hours. The MoldStat Plus will sink into the material, reaching and killing the mold roots that may yet remain. Remember that MoldStat Plus contains no bleach or bleaching agents so it won’t remove mold stains or residue, unless you scrub it, but it will kill mold of any type on contact. Once the cleaned area has dried you are done with the cleanup of your mold issue. However, there are two additional steps you might choose to take depending on your situation. Each of the following links are directed to state government portals that may themselves contain additional links to information outside of the state systems, but each of those sources of additional information will have been approved by the state in question as valid, reputable, and reliable. Different states devote differing levels of resources to providing mold information to the citizens of their respective states. All reasonable attempts were made to locate state-specific resources sponsored by the respective state governments. In this, the fourth of an ongoing series, post, the staff at CleanerToday.com presents state-level specific resources for mold prevention and cleanup. Each of the following links are directed to state government portals that may themselves contain additional links to information outside of the state systems, but each of those sources of additional information will have been approved by the state in question as valid, reputable, and reliable. Different states devote differing levels of resources to providing mold information to the citizens of their respective states. In this, the third of an ongoing series, post, the staff at CleanerToday.com presents state-level specific resources for mold prevention and cleanup. Each of the following links are directed to state government portals that may themselves contain additional links to information outside of the state systems, but each of those sources of additional information will have been approved by the state in question as valid, reputable, and reliable. Different states devote differing levels of resources to providing mold information to the citizens of their respective states. 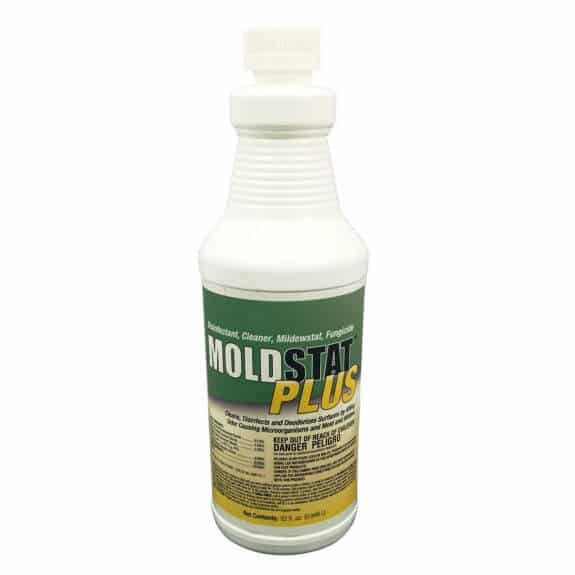 MoldStat Plus is sold as a concentrate that the customer must dilute with water to create the solution strength to clean items. The bulk of any such solution will be water so the item to be cleaned must be able to withstand contact with water. It isn’t necessary to soak items in a MoldStat solution to clean the mold, so you could use just a light wiping with a heavily wrung out cloth or sponge to clean many items. Fortunately for Tony, and for anyone else confronting a similar situation, MoldStat Plus DOES NOT REQUIRE wiping or other physical agitation to be 100% effective at killing mold on wall board or other surfaces!